Spend a leisurely morning or afternoon visiting the best snorkeling locations around the lagoon of Bora Bora. During the 3.5 to 4-hour cruise, you will stop at 4 or 5 different locations where your crew will aim to see manta rays, eagle rays, sharks, moray eels, barracuda, coral gardens and all sorts of tropical fish, everything that the lagoon can offer the day of the tour. 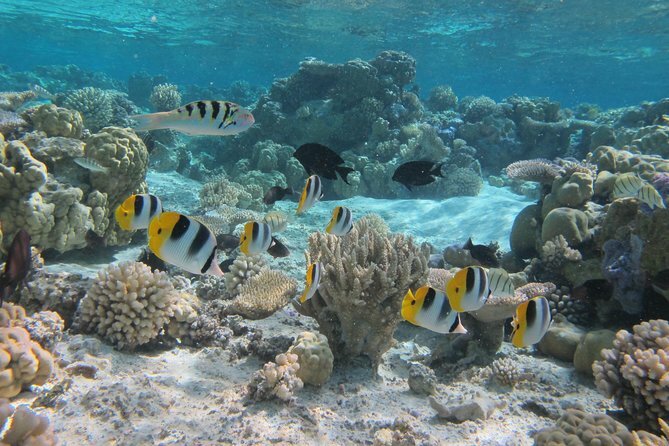 All snorkeling equipment and towels are provided as well as light refreshments and snacks. The boat has a small cabin to store your belongings in a dry area and in case of bad weather for you to take shelter. Small groups are guaranteed (maximum 4 people). 10% discount on purchases at Deep Sea Pearls, Bora Bora. All people welcome although being able to come in and out of the water with a ladder is recommended !